One of the looming challenges in post-earthquake Nepal has been, and will continue to be, reconstruction of the estimated 600,000 homes that were destroyed. There are many rebuilding methods that have been proposed using mud, bamboo, even empty beer bottles. Across the 15 hardest hit districts many who lost homes are already salvaging bricks and roofing material to rebuild their houses before the rains come. In the longer-term, there is expected to be trend towards reinforced concrete structures since most such buildings survived the quake, while the mud mortar and brick buildings collapsed. Finding a cheap and environment-friendly alternative to bricks in post-quake reconstruction could solve many problems at once: of safety, environmental protection and cost. Three technologies are already available and only need to be scaled up: rammed earth, compressed bricks and interlocking soil-cement bricks. 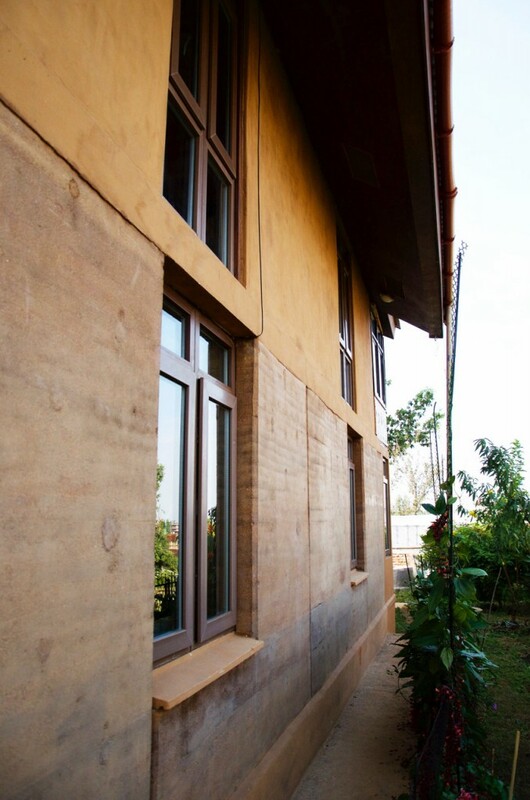 The wall of a home made with rammed earth technology can be attractive and safe. Rammed earth is a building technique that compresses locally-available clay, sand, gravel and some cement into vertical moulds to construct walls. Tamping the wet mixture is done with long ramming poles. Entire walls are built inside the frames, then joined with other panels and beams to build the house. Rammed earth is used in portions of the Great Wall of China, and in some houses in northern Nepal and Bhutan. “The main plus point is that it costs one-third less than a normal house, it is environment-friendly and has insulating properties,” explains Nripal Adhikary of the Kathmandu-based Adobe and Bamboo Research Institute (ABARI). Rammed earth has taken on added significance after the earthquake since houses ABARI built with this technology withstood the shaking. Says Adhikary: “Rammed earth is just as earthquake resistant as any other modern house and it is very good at resisting damage.” For added strength, rammed earth buildings can be reinforced with steel, wood, bamboo or wire mesh. A manual compactor being used to make Compressed Stabilised Earth Blocks for a school in Bardiya. An even simpler and cheaper solution for post-earthquake reconstruction are Compressed Stabilised Earth Blocks (CSEB) in which clay is mixed with cement in a 96:4 ratio at the building site itself, and compressed with a manual compactor. The resulting bricks are even stronger than kiln-baked bricks, and because they don’t need furnaces, eliminate air pollution. CSEB have been successfully used to build dozens of schools in the Tarai. Replacing bricks in Kathmandu Valley with CSEB would not just save money, but also rid Kathmandu Valley of its air pollution, especially the harmful soot particles below 10 microns which are emitted by brick kilns. 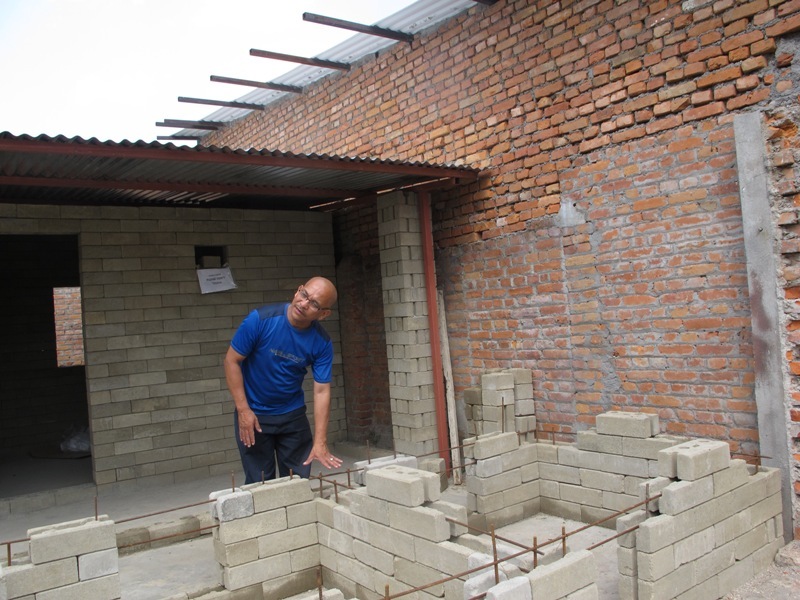 Another solution that combines the strengths of rammed earth and compressed earth blocks is a system of interlocking bricks developed by Nepali inventor, Gyanendra R Sthapit at the Habitech Center of the Asian Institute of Technology in Thailand. The award-winning idea has been used for post-tsunami reconstruction in Thailand in 2008 and after Cyclone Nargis ravaged Burma in 2010 to build more than 1,000 homes, schools, health clinics. Interlocking bricks can be made at the building site itself by mixing locally available clay with 15 per cent cement and does not need to be fired. The walls are reinforced horizontally and vertically, especially at the joints. A typical three-room house can be built in two weeks because the bricks self-align, and can cost up to 40 per cent less than a conventional brick-cement house. Habitech’s office in Khumaltar is made using interlocking bricks and suffered no damage in the earthquake. Iswar Joshi of Habitech is busy responding to post-earthquake reconstruction inquiries from schools and individuals, but says the main challenge is to scale-up the technology when there is a shortage of manpower, so it can be used where it is needed the most. A 550 sq ft three-room house made of cement fibre panels costs about Rs 10 million, but owner Sudarshan Joshi says he is not trying to sell the houses for now, just showcasing them since the priority for Nepal now is emergency relief supplies. SB Furniture is donating 20 containers of imported roof tiles for earthquake-affected areas, and is looking for local partners for distribution. The furniture company is also helping rebuild schools and monasteries in Central Nepal. There does seem to be a strong demand for these light and easy-to-build structures from those whose houses were either destroyed or damaged by the earthquake. Joshi was already selling prefab wall panels to high rises in Kathmandu before the disaster, and says the technology is ideal for family homes, government offices and schools in the earthquake-hit areas. They are slightly cheaper than normal brick and cement houses, and there is a range of designs for buildings of various sizes that can be put up in 20 days as a permanent home. Heartly thanks to such an informative and useful article. I would like to know where we can buy compressed clay brick machine in Nepal. It would be highly appreciated and helpful to the people in need. 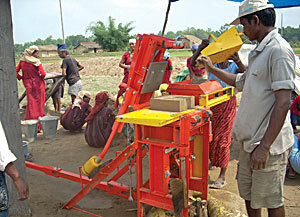 I want to buy and give these machines to people in a village so that they can make bricks on their on their own. Really the article was helpful and useful too. I am interested in this interlocking bricks machine. I would highly appreciate you could let me know where can I buy this machine in Nepal and what would it price be and it’s model. Thank you.